Product code: W175cc Categories: Other Watches, Watches. Here is a ladies 1920’s Art Deco platinum diamond watch by Birks that has all the charm and character of the era. With a fabulous geometric design that makes this diamond watch a piece of jewellery as much as a fine watch, day or night, there is little doubt that it will always be admired. Set with fourteen diamonds on the case, there are an additional four diamonds set at each end where the cordette band passes through. These diamonds total 0.66 carats and add the right amount of charm and scintillation to the watch. With a lovely clean dial, the numerals have that wonderful Art Deco font that truly exemplifies the Art Deco period of the 1920’s. Inside is a manual wind 15 jewelled movement made by Birks that has been fully serviced and comes with our twelve month warranty. With the watch case measuring 36.6mm or 46mm from end to end where the band fittings are by 11.7mm across plus the crown, even the side of the platinum case has been expertly hand engraved. This ladies Art Deco diamond watch is just so lovely to wear as both a watch and a piece of jewellery. 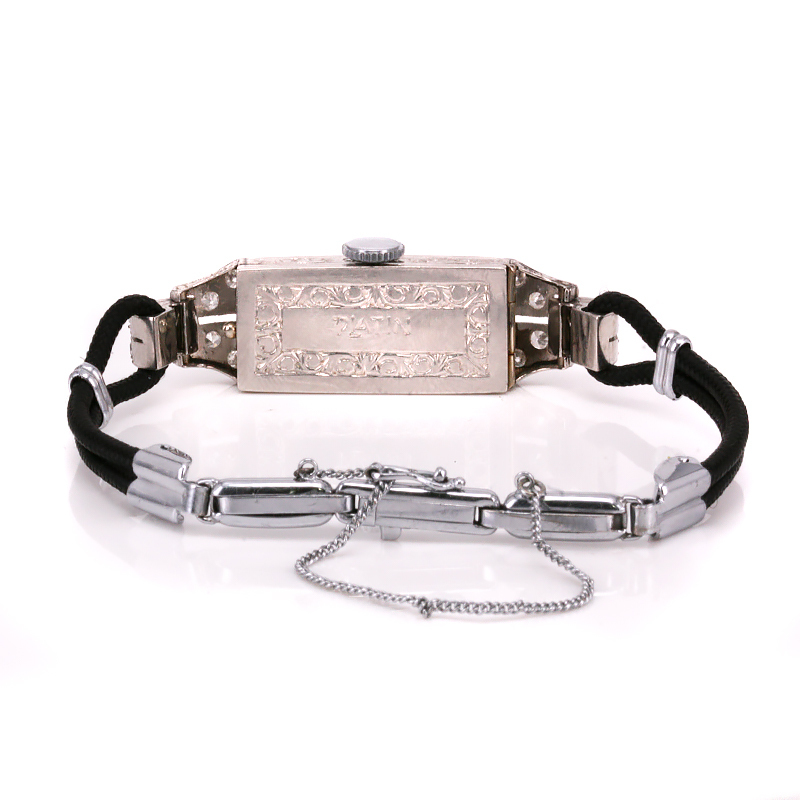 Tag: Art Deco diamond watch. Highly regarded, Birks were known for their quality of jewellery. This Art Deco diamond watch by Birks will always look and feel so special on the wrist. 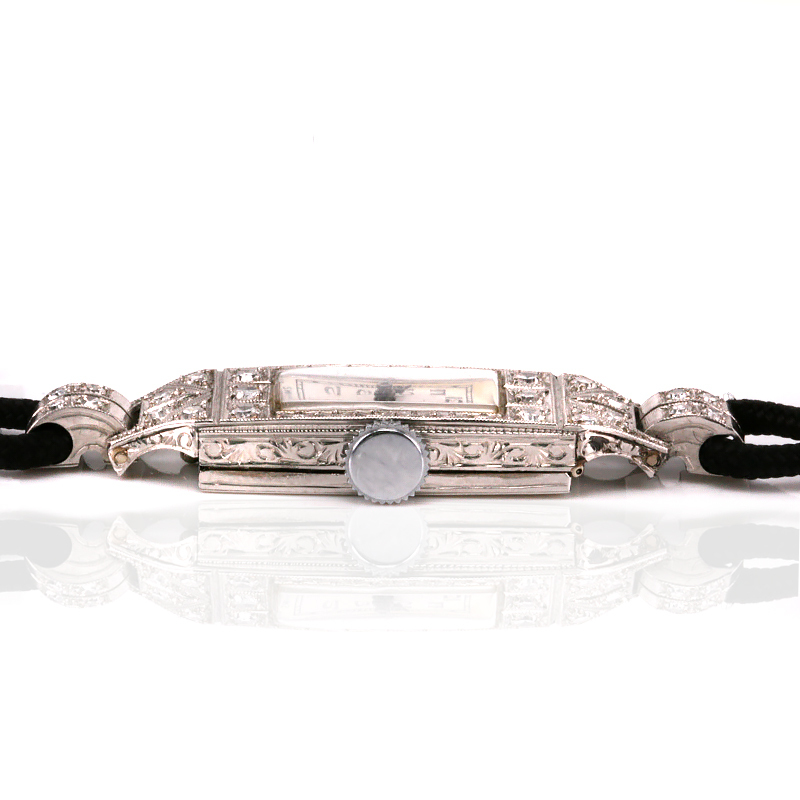 Set with twenty two diamonds, this Art Deco diamond watch is a piece of jewellery as well as a watch.